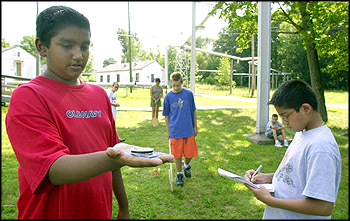 Picatinny Arsenal - August 16, 2001 - (above) Ricky Thumar, takes compass readings as teammates Shane Aruzza, measures off the meters and Malay Amin, records their moves during an orienteering exercise. 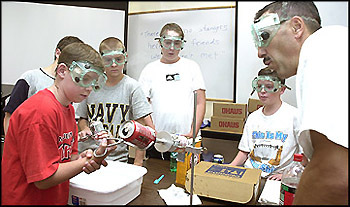 (right) Science Instructor Joe Benvenuto, conducts an experiment where the students crush a can with steam. Picatinny Arsenal - (above left) (l-r) Thomas Malejko; Tiffany Tsui; Akhila Iyer; and Lily Dang; create Tessellation T-shirts. 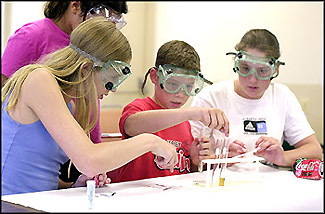 (above right) (l-r) Caitlin Grotke; Russell Lynch; and Megan Larcom; conduct pH level experiments. 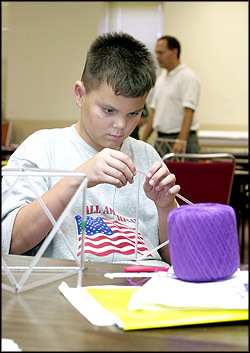 (left) Austin Ascura, creates a 30 edge isoahedron. 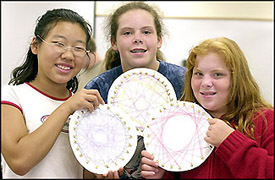 (below right) Stella Lee; Melissa Zablatzky; and Cati Conlon; show off their string art.